The Sheriff provides the overall leadership, strategic direction and management for the Sheriff’s Office. The Sheriff is charged with the responsibility of maintaining the public peace and protecting the lives and property of all citizens in Seminole County. The Sheriff serves as the chief law enforcement officer of the county and his four main responsibilities while serving the public are: conservator of the peace, chief correctional officer, chief bailiff, and executive officer of circuit and county courts. The Office of the Sheriff includes the Office of the General Counsel and the Office of the Chief of Staff. The Office of the General Counsel, which manages all legal issues associated with the agency’s patrol, investigations, jail, juvenile and child protective services functions. The Office of General Counsel is responsible for agency representation, preparing legal opinions and legislative proposals, training, contract review, and monitoring civil litigation. The Office of the Chief of Staff is an extension of the Office of the Sheriff and is responsible for leading agency-wide strategic initiatives, serving as a liaison to external stakeholders, and steering employee engagement and community outreach efforts. This office also oversees the Public Affairs and Professional Standards Divisions as well as manages the agency’s non-profit organization and two community advisory boards. The Public Affairs Division spearheads the agency’s external communication and public outreach programs and delivers a variety of resources and support to the community. Public Affairs personnel are responsible for implementing educational and awareness campaigns, working in conjunction with patrol and enforcement personnel to prevent and disrupt crime, and coordinating public relations. The Division administers the agency’s volunteer program and houses the Public Information Unit, Code Enforcement Team, School Crossing Guard Program, Volunteer Services and the Neighborhood Services Unit. The Professional Standards Division is responsible for ensuring compliance with the Sheriff’s Office written directives by processing and investigating administrative complaints made against Sheriff’s Office employees. It also houses the Professional Development Section which ensures SCSO’s workforce receives the training and instruction necessary to effectively carry out duties and maintain compliance with state training standards. The Department of Youth Services includes the Child Protective Services Division, the Juvenile Justice Division and the School Safety Division. Child Protective Services conducts child protective investigations (SCSO is one of six Florida Sheriffs Offices to contract with the Department of Children and Families to assume this responsibility). The Division also houses the Crimes Against Children Unit. The Juvenile Justice Division offers a broad-based spectrum of services to target and address the unique issues that perpetuate juvenile crime. This division includes the Juvenile Assessment Center, the Juvenile Detention Center, and the Youth Services Prevention and Enforcement Center. The School Safety Division leads the safety and security initiatives for all schools throughout Seminole County, regardless of jurisdiction. It also houses all of our school resource deputies. The Department of Administrative Services supports the human, fiscal, and business functions of the agency. Fiscal Services handles budget preparation and payroll, accounts payable, contracts maintenance, facilities, fleet and purchasing. Human Resources coordinates employee hiring, records, benefits, recruitment and health and wellness. Grant Management evaluates, applies for and maintains all grant accounts within the Sheriff’s Office. The Technology Solutions Division provides computer and technology support to members of the Sheriff’s Office, as well as outside agencies. The Communications Center handles all incoming calls for service for law enforcement within unincorporated Seminole County and five municipalities within the county. 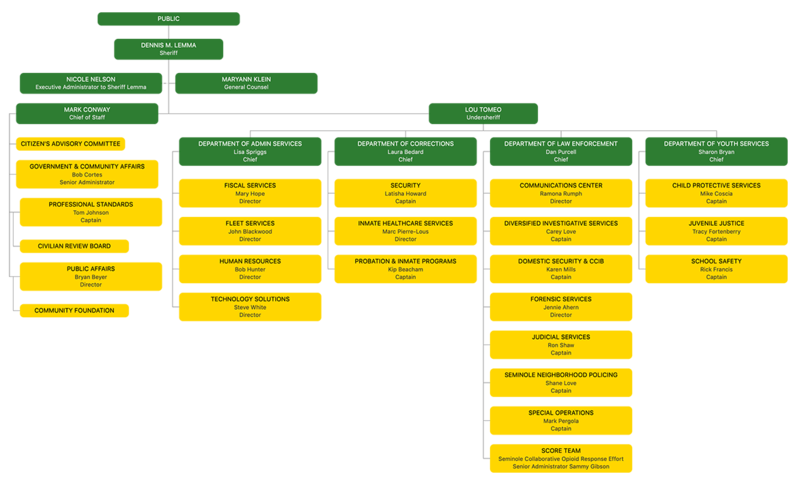 The Department of Corrections and Judicial Services is divided into four divisions: Administrative Services/Intake, Security Operations Services, Inmate Healthcare Services, and Probation. This department is responsible for detention services and manages the care, custody and control of inmates incarcerated at the county jail which is known as the John E. Polk Correctional Facility (JEPCF). The mission of JEPCF is to provide a secure facility that ensures the safety of the public, provides a safe working climate for employees, and offers humane and safe living conditions for inmates. Within the JEPCF is the Administrative Services/Intake Division which includes inmate classification, inmate programs and reentry, and intake/release, the Security Operations division which includes security, special management, food services, and laundry, as well as the Inmate Healthcare Services Division which includes all inmate medical and mental health services. The Probation Division includes county probation, EMPACT monitoring and other probation functions.